Very very exciting. It's all come together and when things do it's not owing to a matter of time rather that it's just meant to be. Give it a good thorough shakedown, someone on the previous entry gives a good solid course to shake out the cobwebs. If all holds up for sure you're good to go. Even 6000 miles @ 10kts min. gets you there in the good weather window systems plus you got 20+kts acceleration with "Wild Eye's" weather permitting. Lot's of time and lots of speed at your disposal. 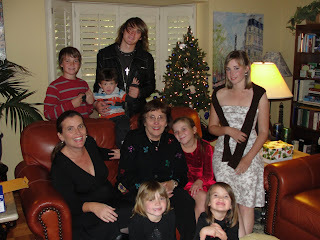 Hi Abby, nice to see you all at home for the Christmas photos,(and you in a dress)nice touch. The sea trials will come together well from the way you describe what is happening. Photos of Wild Eyes from the mast head are amazing, I like the cantered spreaders, are you still carrying the back-stays for bending the mast to suit the conditions and speed? It appears from the photos that the radar domes are on the mast, do you have a standby dome on the coach house,in the event of a de-masting? 3. There's ANOTHER! solo navaigator from India, Dilip Donde , who's 600 nm behind Jesse coming out of the West bound for the Horn. 4. Zac's old buddy Minoru Saito is STILL!! down there in Punta Arenas getting ready to leave for the second time.He's been down there since he and Zac left Cape Town. He'll be heading North West to back home to Japan. You're all going to cross wakes ! How cool is that. 1 coming from the West + 1 leaving from the South + 1 coming from the North + 1 coming from the North. Can we one up this craziness? How about Jesse's mom dispatch a care package or package of letters or something to you, if all goes to plan at some stage you'll be sailing parallel. I believe a rendezvous is permissable, no food or parts though, but letters yes, even Jesse Martin got tossed a bundle of letters on his trip. What a story that would make. Even all that aside simply 2 Sutherlands solo circumnavigating crossing paths with Minoru Saito on his same solo circumnavigation is out of this world. Good to hear you replaced the autopilot. A Google search turns up positive reviews of the Coursemaster system you installed. Which model are you using? Also, will you carry a spare? By the Way: Will you have a self-steering vane? Trying to figure out what kind of redundancies you'll have for steering, which will be essential for what you are doing. Seems like a wind vane -- even if you couldn't use it dead down wind because of surfing speeds - - ought to be usable for broad reaching and going to weather, which could get you to a port (and allow you some sleep) if your new system went out. Fun to hear you are reading Jessica's blog. She's a good writer, and has managed to post just about every day. Thanks for all the pictures(and don't you look lovely)and the information. Although I don't understand what there all used for, it sounds very impressive, and most important that you will be well protected. Now it sounds like you're getting down to the real "Nitty Gritty", just ten (10) more days and you'll be on your way. Yes!!! Take care Abby, I'm looking forward to the big day also. There’s another sailor coming along behind Jessica, Dilip Dondi from India. He's sailing a 47' boat and running fast. I don't know any details other than that. Well take care Abby, and try not to get too excited. Ha, ha. Looking forward to your next post, if you have time. Just wondering whether you have decided on a route, noting on your website that you are "vying to smash Perham's freshly forged record." Does this mean you are not chasing Jesse Martin's record and sailing around Cape Horn. Probably prudent considering the weather window...last year there were too many icebergs for sailors to round Cape Horn in the first week of March. It was recommended that the start of the Sol Oceans from Wellington NZ take place before January 10 2010 due to this risk and that is riding the strong westerlies to the Cape, not contending with the doldrums and beating down the coast of South America. To Anonymous, Jessica Watson is less than 2000 miles and 14 days or less from Cape Horn, not 40! Whichever route you decide I wish you a safe and successful journey. Phew...sounds there's going to be a rip roaring international feast down at Cape Horn in the next couple months. Maybe everyone can raft together and have a tea party or something. Jessica's got ample supplies and ingredients it seems and her baking down pat. She can provide the cake and biscuits. Saito has to have a stash of fine Japanese teas. Our friend from India can provide the curry for the main course and the fashionably late Abby can bring the iceberg lettuce for the salad. You're starting to get a few mentions from the bloggers on Jessica Watson's site. I thought I'd better acknowledge your Quest as well since it looks like you will get underway shortly. I'm in Australia and I admire young people like yourself 'not talking just doing'. Good luck on your Quest. It's good to hear things are coming together and soon you'll be out there enjoying it all. Thanks for the great photos. You look lovely and you have a beautiful family. 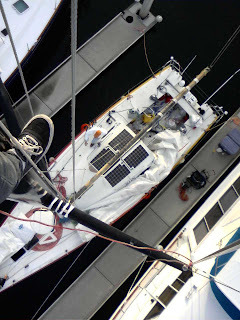 The photo from the top of the mast is ... well... to a non- boat person like me, a bit 'way up there' ... I like my feet on the ground and I think anyone who climbs up there is very brave. Looking forward to reading more on the progress. from the Sunshine Coast, Qld. take care. "last year there were too many icebergs for sailors to round Cape Horn in the first week of March"
April 7 2009 56 37 S, 68 21 W Minoru Saito officially rounds Cape Horn. From the East. No ice in sight to that date. April 11 2009 56 46 S, 71 08 W Minoru Saito starts heading north and states "He reported seeing his first ice yesterday, best described as a small “berger bit” -- not a large iceberg but a chunk large enough to be spotted at some "
That's April 11 2009. Austral Autumn begins 1st April. If we are reviewing historical data, Minoru Saito sighted his first ice April 11th. You cannot compare this one-time unique monster iceberg A-53A which had been monitored since 2005 with what is going to happen in March 2010. 4 months to get to and round Cape Horn in an Open 40 including the doldrums is ample time barring of course the entire Antarctic decides to up anchor and drift to Cape Horn to block her route to ensure Mike Perham and Jessica Watson "win". and finally the SolOceans has been delayed till 2011. That's still its inaugural race. A complete shambles. And absolutely not a data point to refer to at this time at all about rounding Cape Horn in March 2010. Wishing you Godspeed and All the Best! Having the opportunity to vicariously be part of the journeys of Zac, then Mike, now Jessica and you, I think that all of us armchair adventurers are getting an amazing ride. Thank you, Abby. Please accept my best wishes for Godspeed and fair winds. Ex-Pacific Northwest, now N. Calif. I can't seem to find your website. What is the URL? When Does the Dodger Go On? Over on Jessica's site, an eagle-eyed "Steve in California" notes that Wild Eyes doesn't yet have a dodger. From photos it looks as if the cabin house roof projects a few inches over the aft bulkhead to protect instruments, but seems like the voyage would be more comfortable and safer if Abby had a dodger -- either a fiberglass one such as Zac had, or a canvas dodger with a very heavily built frame and handholds. Good news and beautiful pics. I like to read that your yacht is being well equipped with uptodate devices. Work well and think of every detail. I join my voice to a fellow blogger, you should have a hard-built dodger, like on Ella's Pink Lady. It looks a very helpful add-on, worth some extra-work or delay. Remember that you never have enough good cards in your hand to play such a difficult game. The next couple weeks sure will be exciting and hectic for you. Hope the sea trials go well but if it takes more time to iron out any issues, that's not just time well spent but absolutely necessary. I'll be following your trip and wish you the very best. not sure where a dodger will go or do what on an open 40. the cabin roof is maybe waist high when standing up and neck high when sitting down and maybe 2or3 ft below the boom and it's nearly centered. Be interesting if something can be done. Anonymous makes a great point with the photos. Placing a dodger on Wild Eyes wouldn't be an easy thing to do. One possibility would be to create an athwartships seat against the exterior cabin bulkhead. This would enable some headroom, and get Abby sufficiently amidship to be covered by some sort of a dodger. It would likely look ungainly and would clash with the sleek lines of the boat, but seems like some sort of a backporch cover would be nice so Abby could sit in the cockpit without getting pelted by every wave that spashed aboard and without getting dumped on by the rain or blasted by the doldrums sun. But with all the talent you've got on your team at MDR, seems like someone should be able to figure out something to shelter Jessica from the weather. Hey, clearly these boats are not intended to have a dodger, but well....I've been huddled to often up against the bulkhead while on watch at 3 Am just coming up the Nor Cal coast in Aug. Seems like something (almost anything?) would help provide some shelter where she's headed. The "job" is of course to go and get it done. Not hang around and bake cookies and surf at every possibility at every port that you can, like the Zactser. It's a machine that needs to be driven and you have to hang on. Abby just be sure the single most important thing you need to know is that you have to stay away for 3 or 4 days in a row. You go girl! :-) You and the team are doing a fantastic job. Wow, only 10 more sleeps (maybe 9 now), before you set sail. Take care my dear and keep safe. I'm looking forward to hearing all about your adventures at sea. I heard them dodgers must be really good. Take them with you on your trip! Best wishes for when you get under way, Abby. I'm a follower of Jessica Watson's blog. I hope you have the fair weather she has enjoyed thus far. Well, the dodger will probably remain a comfy wish. Thank you, Steve, Grant, and Anonymous, for all these informations. Abby's Open 40 definitely seems to be a Speed First choice. I hope she will like living in damp for 5 months. I must confess that personally, I would prefer a Mercedes Benz for 8 months, but after all, i am only an armchair sailor. I joined your blog because of how much I admire what you are doing! I have four children: Andrew 14, Raquel 13, Xenia 11 and Jessica 9. You have inspired me to get them to really go after their dreams. Not only that, but also to dream big. Living in Van Nuys and coming from a poor family, my brother and I put our dreams aside in order to just make it out of the barrio and live a normal life. Dreams to us were just that, dreams. Making them a reality was not something we actually thought we could do because of the lack of education and support offered to us. You, however, are proof that Love is enough to keep dreams alive and bring them into fruition. Your parents Love and support has given you the opportunity to live out your dreams. I am determined now more than ever to do the same for my kids. I look forward to following your progess and seeing you succeed! God bless you and your family! love the picture from the mast! so cool!